Brian's Taiwan: Don't phase me, Bro! So today was the big day of the typhoon. Besides a few moments of hard rain, it was just the gusty winds. Reports say it was blowing at 60-80mph. However I don't have to worry about any of that inside the condo. The only wall that faces outside, faces a small central courtyard with two more floors above me. So no worries of sideways rain and high winds battering the windows. However during lunch and dinner, I decided to go out to see how the rest of Taipei handles the typhoon. I was suprised to see a few resturants open. People, motocycles and cars were still moving about like normal. So for dinner, instead of eating in, I headed out to the Shipai night market. It was business as usual there. 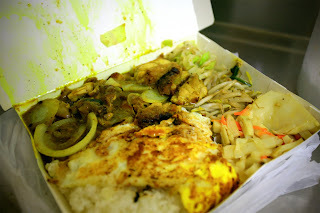 I stood in line for a curry chicken (咖哩雞腿) bento. There was a long line so I had to wait 15 minutes while the winds battered my face numb. Most of the venders just string up a wind block and continue like the typhoon doesn't exist. It doesn't phase them. Meanwhile garbage, plastic stools, chopsticks, egg shells, newspapers and cardboard was flying all over the place. The gusty winds were strong enough to push my body around and catch me off balance a few times. I didn't expect the night market to be open or so busy, so I didn't bring my camera. But I did bring home dinner successfully and take a picture of that. Yum!! Typhoon curry chicken bento! Now where can I find Hong Kong style Typhoon shelter crab (避風塘炒蟹)?